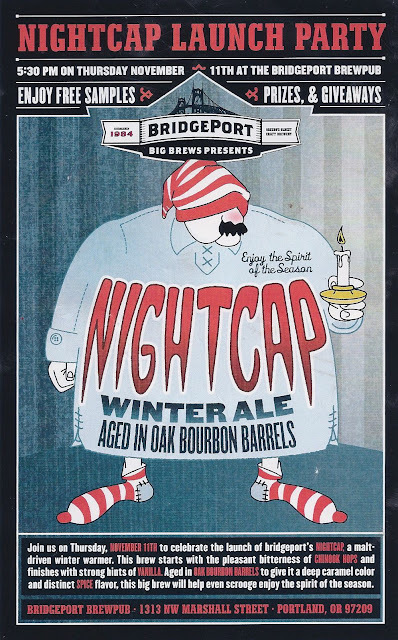 "Nightcap was created to mirror traditional liqueur or spirit nightcaps enjoyed in hopes of warming cold toes and noses prior to a long winter slumber. A malt driven brew, Nightcap begins with the enjoyable bitterness of Chinook hops and finishes with strong hints of vanilla. BridgePort brewers aged 33-percent of the brew in Makers Mark oak barrels for nearly a year – evidenced in the warm and spicy undertones of the brew. Because of its unusual aromatic scent, it is recommended that Nightcap be enjoyed in a tulip glass to allow for the full fragrance to escape." Sounds pretty good, doesn't it? When read that description, I knew I had to get a taste of Nightcap. It sure sounds like the ideal winter ale to me! 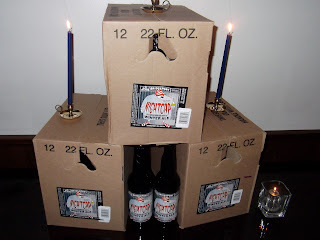 So I went to the party, and sampled a cask version of Nightcap. It lives up to its description. 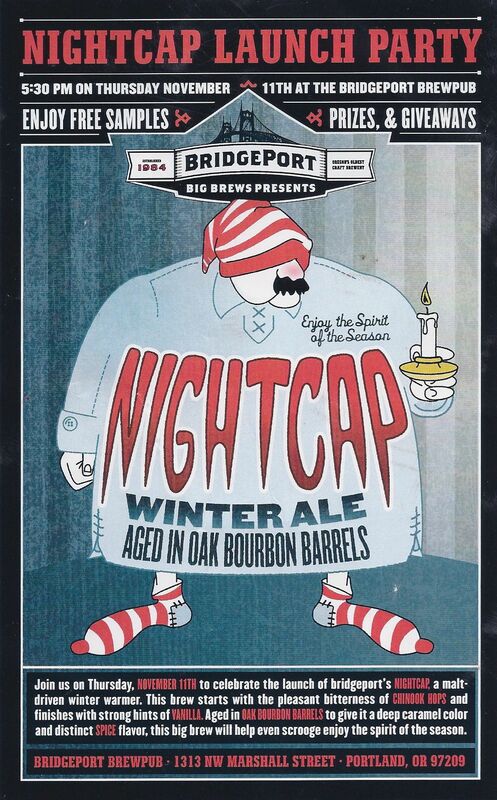 Although I've only tasted a handful of winter beers this season, Nightcap is a standout. I really liked it–so much that I bought a Bomber to take home. I'll write a detailed review in the next few days. 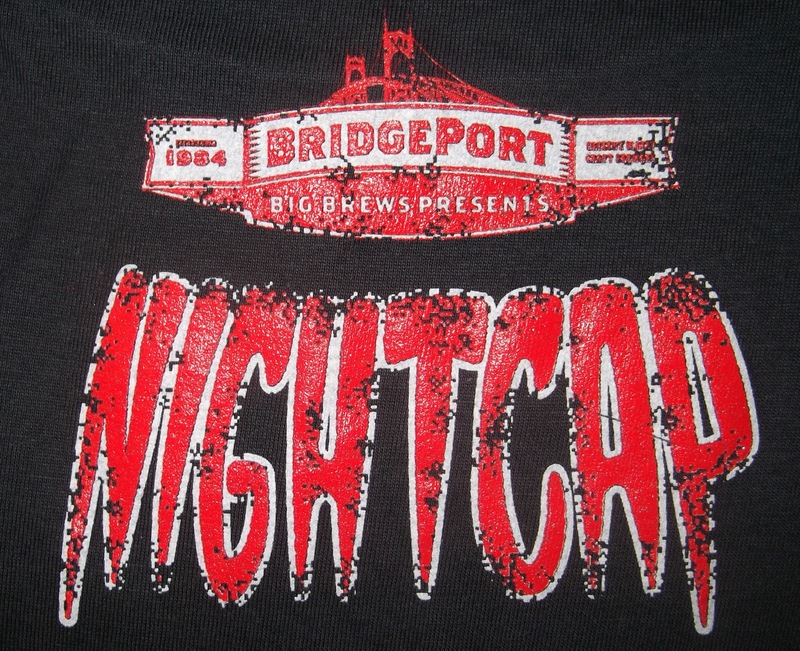 Besides the great beer samples, BridgePort was offering giveaways galore–including long stocking caps (which my 4 year old has already confiscated), t-shirts, and brandy snifter-style tasting glasses. 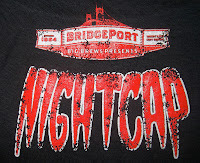 I even had a chance to talk with Jeff Edgerton, BridgePort's Brewmaster. In the video below, Jeff talks about Nightcap's origins and shares a preview of upcoming beer releases. BridgePort's launch parties are free and open to the public. I attended the Hop Harvest launch back in September. I'll publicize the next one in advance–attend if you can! In the meantime, pick up a bottle of Nightcap. You won't be disappointed! I'll be trying this one. Love the bourbon aged ales. Julie and I where drinking one last year in Billings, MT at Yellowstone Valley Brewing. Nice! Tried this today. Very, very good. Yup, it's a good one. I did another tasting at home and need to write-up my formal review.